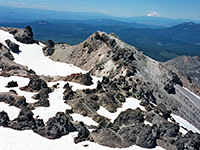 Until the explosion of Mount St. Helens in 1980, Lassen Peak was the only volcano with recent activity in the US since 1851, apart from some in Hawaii and Alaska. It was dormant for 400 years, but then erupted in May 1915, following a year of sporadic emissions of ash and gases, and produced a 1,000 foot lava flow that melted large amounts of snow and caused rock avalanches. Several days later the peak exploded and a huge cloud of debris was projected 7 miles upwards; this was accompanied by more lava and gaseous blasts that devastated a large area northeast of the mountain. 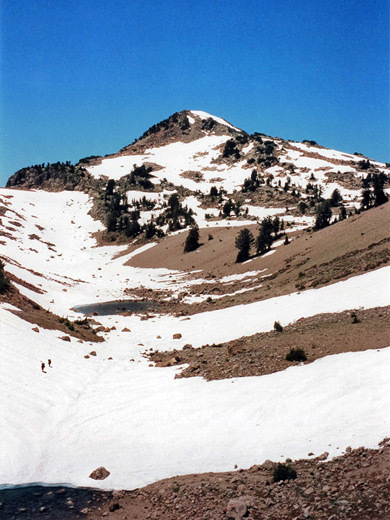 Lassen Peak is the most southerly member of the Cascade Range, a series of largely dormant volcanoes extending as far north as British Columbia in Canada. 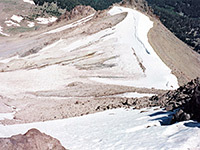 The trail to the top of Lassen Peak starts from a large car park at the high point of the park road, near marker post 22. The well-trodden path is 2.4 miles long and has an elevation gain of nearly 2,000 feet - it ascends a grassy hillside and then winds through a partly wooded area, but for most of the way, the immediate terrain is boulders and bare earth, slightly pinkish in color, with no vegetation. The path has many switchbacks and climbs along a steep ridge that is subject to very strong prevailing winds from the west. Snow may be present on sections of the route even during summer, but the trail is quite popular when conditions allow, and very memorable. A round trip takes between 2 and 4 hours. A large boulder cairn marks the end of the path, but the actual summit is a rocky hill of irregular lava 100 meters further, and it is worth reaching for the views over the Devastated Area to the northeast - this is the direction of the main lava flow of 1915. The ground here is still largely devoid of cover and has pinkish, jagged rocks that extend for several miles. From the top of Mt Lassen, one can gaze for many miles in all directions. To the southwest is the area once occupied by ancient Mount Tehama, and it is possible to see the circle of lower peaks that mark the approximate edge of the caldera (crater) boundary. 70 miles to the northwest but still clearly visible is the distinctive snow-covered cone of Mount Shasta, another extinct volcano of the Cascade range, that completely dominates the surrounding flat lands. 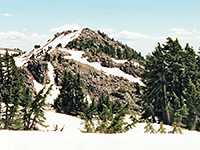 The northerly peaks of the Sierra Nevada range are observable to the southeast. 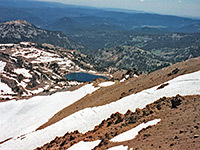 On the far side of Lassen summit and about 50 meters below is the crater, which his reached by a continuation of the main path.